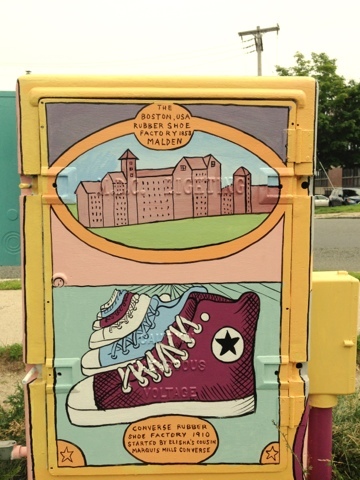 The Mystic Valley art club paints a switch-box in honor of Malden City Council's first African American member, Herbert L. Jackson. Malden Bike Path Mural, "American Values"
Our high school art club designed and painted this mural on the Malden Bike Path. It was sponsored by Yankee Pest Control Co. We had a great time! This painting, "Year of the Dragon", is by one of my graduating senior students who was accepted to Mass. College of Art & Design. He was awarded the prestigious Tsongas Scholarship, which provides 4 years of free tuition and fees. The painting is an example of my cultural portrait project. Junior year students interview an immigrant to the USA and create a work based on their cultural research. When Stephanie Mahan Stigliano invited me to make a print about the March 5, 2007 bombing of the bookseller’s district in Iraq, I immediately thought of my friend Dr. Fawzi Abdulrazak, who owns a private book store in Cambridge MA. He is a leading scholar who wrote, “The Kingdom of the Book: The history of Printing in Morocco” and “The Fez Lithographs, Annotated Bibliography with Historical Introduction”. I asked Fawzi if I could draw a portrait of him and if he remembered Al-Mutanabbi Street and with an enthusiastic “Yes”, he agreed to meet me at his store. I arrived with my camera and he was mysteriously waiting with a flash light in the darkened storefront at 600 Cambridge Street. I took many photographs as he showed me some historic and beautiful books. He talked of his memories and described the vistas of Al-Mutanabbi Steet. As a young man he would visit and talk with many writers. Latter in his store room he showed his journal from those early days. The etching is a portrait of Fwazi holding the journal of poems he wrote as a young man. 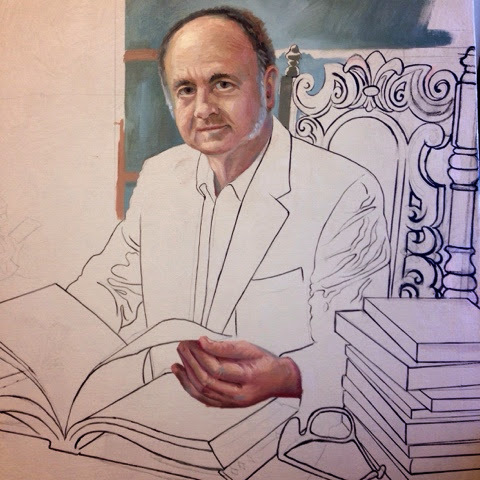 I am working on a copper plate etching of my friend, Mr. Abdulrizak, a book dealer in Cambridge. I was invited to make a print for a project about the bombing of Al Mutanabbi Street in Iraq. Line etching on copper is a beautiful process. This is the second proof; I will add more cross hatching to build up the gray and black tones. I was happy to be invited to paint at Graves Lighthouse in Boston. The lighthouse is being restored by Dave Waller who purchased it at an auction held by the Coast Guard. I was dropped off on a rocky area at the oil house, a small building on the rocky site. I am always happy to announce the winners of the Scholastic Art & Writing Awards. This year, Mairin King in addition to the Gold Key Award also won a National Silver Medal for her painting, "Body Image Inside Out". She was invited to attend the ceremony at Carnegie Hall in NYC! The 10 class session is over. In the photo below: Ray Duval, my teacher, was working on a large vase when I went to pick up my glazed pieces. When I asked if he thought I could throw a large vase he said, "Practice!". The pots and mugs that I made below, were fired. It was a surprise to see how the glazes turned out. My favorite is the little turquoise cup which is a spherical form with a symmetrical lip and foot. The first few bowls I learned how to make are finally glazed and fired. 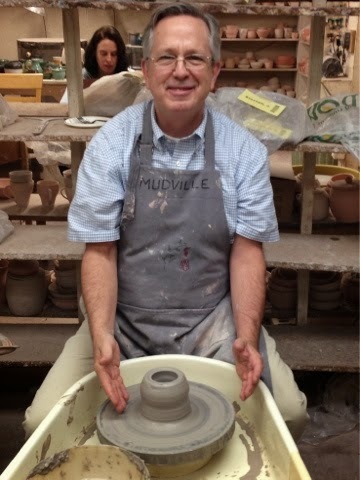 Only two more classes at Mudville and then I'll start to teach wheel throwing to my students at the high school. The Bee Bowl is one of my favorites. I want to do more painting on the vessels. It's difficult to spend much time drawing at the Mudville studio, since I'd rather be throwing. There IS joy in Mudville, as seen in my smile, below. I signed up for a 10 session course in beginning wheel throwing. Each class is almost 3 hours long. Ray Duvall is a great teacher. Every Thursday night I get to learn and perfect a new skill; throwing pots on a wheel is so much fun. These five bowls have been bisque fired. Now they are ready for the glaze. Glazing is as much an art as the forming of the vessel. The colors are somewhat accidental. It is difficult to predict how each one will turn out. My first two were experiments with greens, blues and purples. The photo below shows Ann Hamilton's two painted vessels with images of farm animals. They are stunning. Ray Duval was showing us different ways to apply the surface treatments. Mudville was started by Ann Hamilton in 1974. Click on the picture below to read more about this wonderful non profit organization. It is a casual and very personal place to learn at one's own speed. History painting for Fellsmere Pond: Black line in a cross hatch technique was used to tell the story of Elisha Converse. 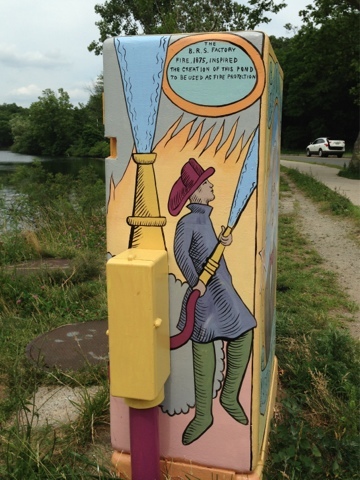 Converse hired Frederick Olmsted to design a pond to protect the Boston Rubber Shoe Factory from another fire. I must buy a pair of Chuk Taylor's! 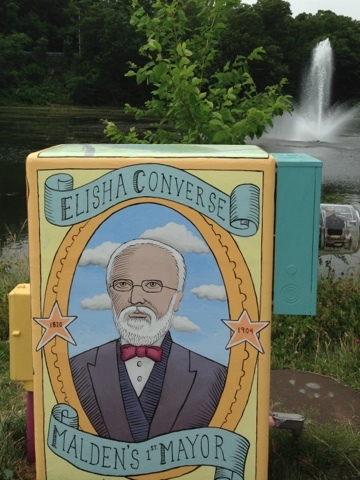 Elisha Converse's fourth cousin started the Converse shoe factory. Ann Kurian will be at the Massachusetts College of Art and Design to study Graphic Design. Above is an original logo design which she created Senior year. She used Photo Shop to add her concept onto a truck. Stephanie Patricio will be attending The Art Institute of Boston at Lesley University to earn a joint degree in Art Education and Photography. Her works were displayed above for a 20 min. video for her International Baccalaureate Visual Art oral presentation. She explained her cultural inspirations and art history research using design vocabulary.